Just Shutters are the local experts for Cheshunt Plantation Shutters. We have an unrivalled reputation and would be delighted to introduce your local shutter specialist Tom Parrott; call us today on 01727 221 298 to find out what we can do for you! Tom can carry out a free home design visit, give a full consultation and ultimately share your vision for your ideal interiors before giving you our best prices. Plantation shutters, commonly referred to as ‘window shutters’, are a fantastic option for your home; they offer exceptional practicality as well as exceptional style. In addition, our shutters are very hard wearing, versatile and offer fantastic convenience – mainly due to the ease of cleaning and next to no maintenance they require. Despite the countless benefits, our Cheshunt Plantation Shutters are usually chosen with the heart not the mind. The reason is quite simple – they are simply beautiful, can make small rooms airy and bright and make bold stylish statements in larger rooms. Our selection of interior shutters is the largest on offer in the UK. Our experts ensure that each of our customers receives the highest quality personable service when ordering their Cheshunt Plantation Shutters. 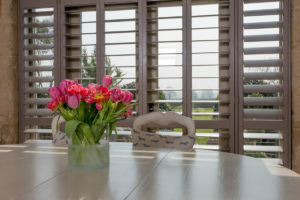 All of these shutters are entirely bespoke, to get your inspiration flowing view our gallery of images – we hope these will enable you to envisage our wonderful shutters in your home. Our Cheshunt Plantation Shutters experts are on hand to help you achieve your idea of the perfect home. To find out what we can to help you, please book an appointment now, call us on 01727 221 298 or request a brochure. Just Shutters has earned an unrivaled reputation in providing Cheshunt Plantation Shutters. Furthermore, our team ensures that our prices are exceptionally competitive all year round. On the other hand they also ensure that we never compromise on quality and provide the best possible service. Don’t just take our word for it! Read our customer reviews below. To read more of our excellent feedback, visit our Checkatrade page for over 1600+ unbiased reviews! Fantastic manufacture and installation of wooden plantation shutters to four windows. The fitting of wooden plantation blinds.